The camera is a tall unit with a cone-shaped base, and four lights up top that can at least flash yellow or blue, Zatz Not Funny indicated on Friday. 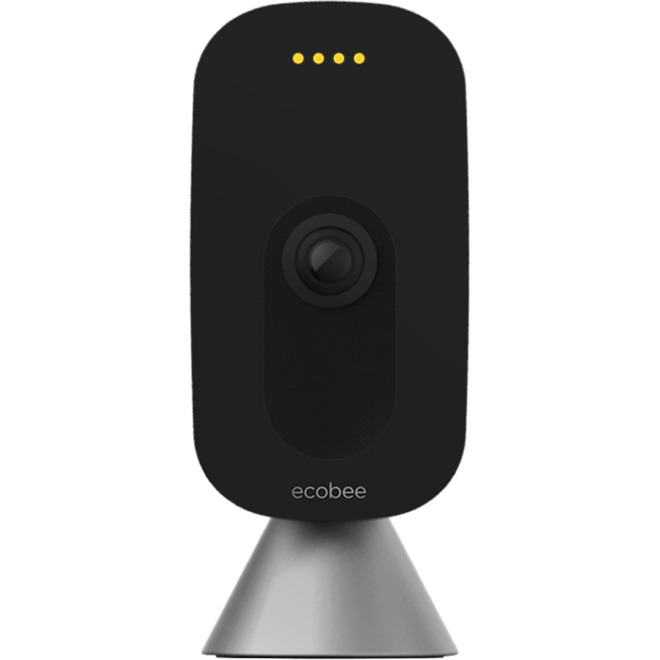 It's likely the camera will not only support Amazon Alexa but work as an independent Alexa speaker, given similar functions in the ecobee4 and ecobee Switch+. Those products are also HomeKit-compatible. Offering the platform in a camera will probably depend on whether or not it's wireless, since Apple has so far kept HomeKit off of battery-powered cameras, presumably because of power drain. Other unknowns include pricing and a launch date. Zatz speculated that the camera could serve as a room sensor for ecobee's thermostats, which can sense presence and help keep temperature and humidity consistent. Years after HomeKit's launch, relatively few security cam makers have enabled it. These include brands like Arlo, D-Link, Logitech, Netatmo, and Somfy. The technology is also in just two video doorbells made by Robin and Netatmo, and the latter company has yet to ship.